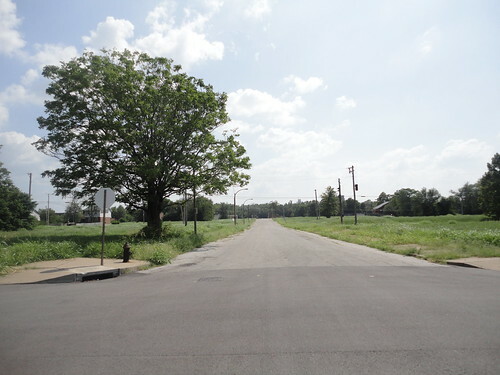 The only thing worse than this city’s abandoned buildings and surface parking lots, is the Urban Prairie that accounts for far too many blocks in North St. Louis. One of the largest expanses of Urban Prairie that I have come across is in the area of North Market and 23rd Streets. This area is just North of the Pruitt-Igoe site and is hardly better off than the rubble that remains from the housing project there. At least the street grid is intact. It’s almost too depressing to try imagining what this intersection once looked like, but the task is made easier (but no less depressing) by the Sanborn Fire Insurance Maps of the area in 1909. This intersection was home to a 5-story building that housed “Moving Pictures” in a neighborhood made up mostly of 2 or 3 story flats. Just around the corner on 23rd was a “Beer Depot”. Although this area was clearly not extremely dense (at least not in 1909), I can count over 20 homes that faced the alleys on either side of N. Market between 25th and 22nd. These alleys are still in place, but only a handful of buildings remain within eyesight of 23rd and N. Market. A look back to 1875 shows another picture that stands in sharp contrast to the current condition of 23rd and N. Market (in 1875 23rd Street was 19th). For me, these historical documents are just ideas of what could be here next. Currently, the slate is all but clean. Although this expanse of Urban Prairie is particularly large and depressing, it is by no means strange to stumble across a similar sight while traveling around St. Louis. Demolitions that continue to occur around our city increase the amount of totally vacant land and decrease the stock of historic buildings with rehab potential. One plus side to the current state of this land is that Paul McKee would have to really try hard to screw up its redevelopment. 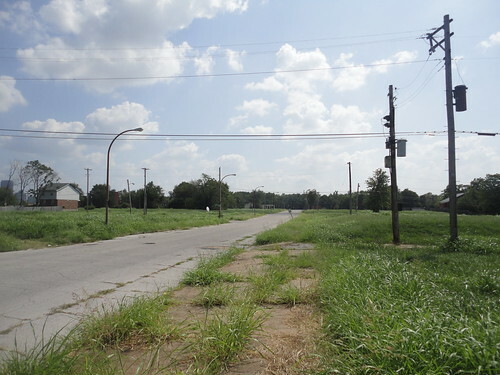 A NorthSide project that narrowed its scope to the Pruitt-Igoe site and the Urban Prairie nearby would have hardly any current residents or legacy buildings to worry about and would serve the purpose of reconnecting neighborhoods that are intact enough to resurrect themselves. Since McKee has announced that he will soon begin work on the Clemens Mansion, these deserted blocks nearby would be a great place for him to demonstrate his vision and possibly win support for his broader plan for the much larger chunk of North St. Louis he wants to redevelop. For more on this area/subject matter see Built St. Louis’ Excellent tour of St. Louis Place and Slow Death of a City Block. 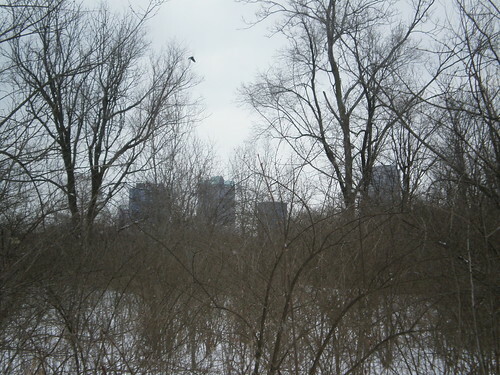 After a difficult experience trying to wade through weeds last time I went to Pruitt-Igoe over the summer, I vowed to return during the winter months when the journey would become more manageable. For some reason I picked a snow day to go. It was still tough to get around this overgrown Urban forest, but signs of civilization were very apparent. 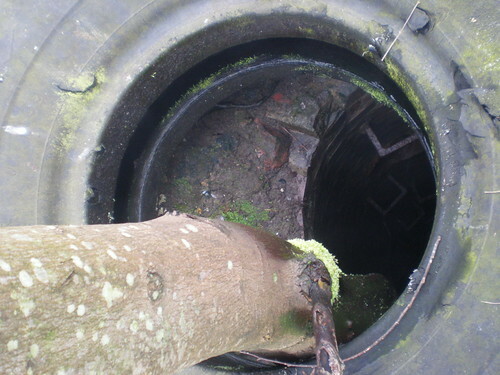 The most interesting site for me were the places that the sewer system surfaces in the dense woods. The familiar smell of sewer gas and a nice patch of melted snow was a powerful reminder of what this site actually is. Could this be a job creation center in the near future? Might it be better for the city left as a forest? More pictures of the day can be seen here.